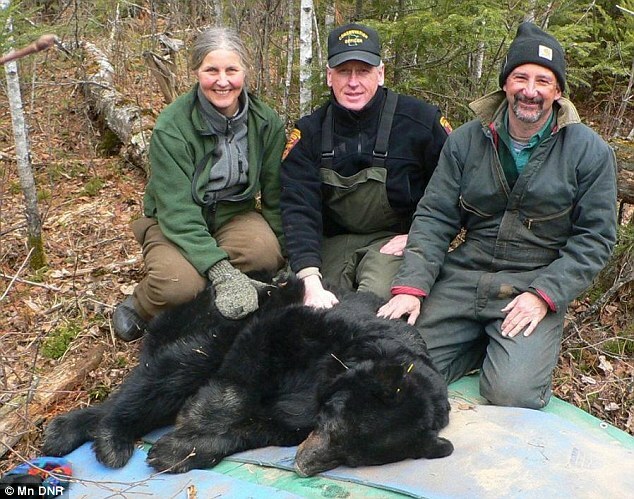 DNR bear researchers with Bear No. 56 after its last handling in March 2010. The world’s oldest-known wild bear has died of old age in northern Minnesota, quietly coming to her final resting place in a shady spot that a bear would find as a good place for a nap, a leading state researcher said Tuesday. The decomposed corpse of the female American black bear, known to Minnesota Department of Natural Resources researchers as Bear No. 56, was found last Wednesday by state researcher Karen Noyce in the Chippewa National Forest near Marcell. The bear was 39 ½ years old. The bear was captured and given a radio collar in July 1981 by DNR scientists during the first summer of a long-term research project on bear population ecology. She was 7 years old and accompanied by three female cubs. In the last few years of her life, Bear No. 56 began to visit bait set by hunters, but they abided by a DNR request not to shoot collared bears. The average age of a bear killed by a Minnesota hunter is less than 4 years old, and about 80 percent of No. 56’s many cubs died by age 6. Of the hundreds of other bears that have been radio-collared and studied by the DNR in 32 years, the longest any survived was 23 years. Some bears in zoos have made it into their 40s, Noyce said.